The RIVNUT® B2007 is adding to the well-established Böllhoff tool range. This new battery setting tool is made for demanding production challenges. RIVNUT® steel and aluminium fasteners from M 3 to M 10 can be processed with this cordless tool. Stainless steel fasteners can be processed from M 3 to M 8. This is electro-hydraulic technology for high power at low weight. Up to 800 riveted joints can be realised with a fully charged lithium-ion battery. Moreover, the new quick-change system allows to change the exchange units without the use of a tool. The B2007 has an ergonomic handle which is comfortable to hold and is also provided with shock protection. It is easy to use since only one button is used for operation – during the entire riveting cycle. 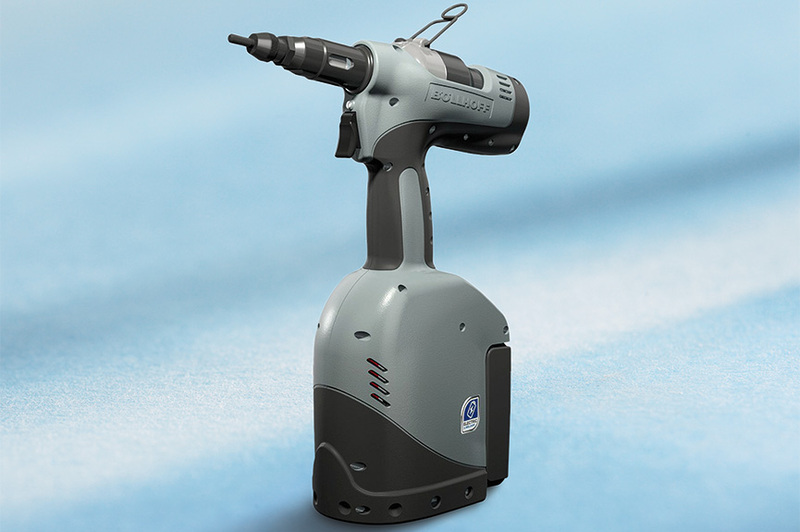 The menu-based user interface on the LCD indicating riveting force setting, parameterisation of the riveting cycle and the battery state of charge makes this tool a great offer. This setting tool was developed in close cooperation with Böllhoff customers to ensure very user-friendly handling in demanding industrial environments. The tool comes in a case with operating instructions, a battery charger and one or two batteries. The exchange units (mandrel and anvil) as well as further accessories are separately available.